Hellebores are downright miraculous. They give you a dazzling display when little else except snowdrops is flowering. 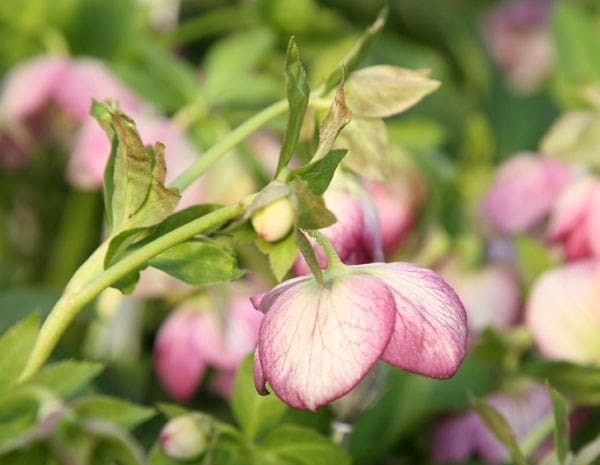 They grow in the least promising of soil and are slug resistant. They survive shade, drought and they are as hardy as old boots. Beyond all these virtues, they come with an extraordinary palette of form;doubles, singles, frilled and colour, everything from the darkest black through pink, purple yellow green and white. Beyond this there is the detailing. Picotees like this one have fine pink lines edging the petals. Harvington Hybrids are some of the best. There are no downsides to Hellebores. Get one and you'll be hooked.